The throat is a fairly complex part of the anatomy, not only does it form part of the upper respiratory tract, but it helps with the initial stages of digestion along with helping form our speech. 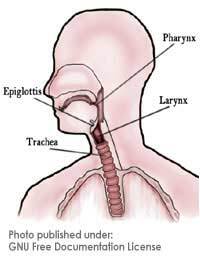 In general, the throat is made up of the larynx (which includes the vocal folds), the pharynx, the epiglottis and the uvula; there are also lymph tissues in the throat called the tonsils and adenoids. The larynx is a group of tissues and includes muscles, cartilage and other soft tissues that are found at the top of the trachea. The vocal folds (or vocal chords), are contained among these structures and close to allow food to pass only down the oesophagus and are prevented from entering the trachea and progressing to the lungs. When air is pushed up through the larynx the vocal folds vibrate and sound is produced, the intensity of the sound can be changed depending on how fast the air is forced through the larynx. There are three sub-structures contained in the larynx and these are called the glottis, the supraglottis and the subglottis. The pharynx is the upper part of the airway and begins at the back of the nasal passages and proceeds to the top of the oesophagus. It is generally considered to be part of both the respiratory tract and the digestive tract. As the pharynx contains many different structures it is broken down into three components: the oropharynx, the nasopharynx and the laryngopharynx. The oropharynx is located at the back of the mouth and comprises of the uvula (the piece of soft tissue that lies at the back of the mouth), the epiglottis, the tonsils and the base of the tongue. The nasopharynx includes the soft tissues that lie at the back of the nasal passages and the laryngopharynx refers to the structures that lie in the area of the throat beneath the oropharynx continuing to the opening of the oesophagus. This is the name given for the piece of cartilage that lies between the back of the tongue and the larynx. It is a very important structure as it is this that causes the larynx to be blocked off during swallowing to protect the lungs from food and fluid. It works as a valve and closes every time we swallow, (even saliva) without us having to make a conscious effort to carry out the action. The uvula is the small piece of tissue that hangs down at the back of the throat. When we swallow it helps to conceal the nasal passages and protects our airways from being obstructed with food and fluid. The adenoids and tonsils are lymphatic tissues and are therefore part of our immune system. The tonsils can be seen at the back of the throat and the adenoids are found towards the back of the nasal passages. Although they are part of our immunity, both structures can be removed if they become problematic, though this practice occurs a lot less than in previous years. They will normally only be removed if repeated bouts of infections are causing too many absences from work or school or are having a severe impact on life in general. Many people underestimate the function of the throat as they are unaware of the delicate structures that are included and how these structures function. Without the network of muscles and cartilage our lungs would slowly become damaged from inhaling food and fluid and would seriously compromise our survival. @love-love - I'm afraid we can't offer medical advice. However, if your GP has said that it's nothing to worry about, then you should be re-assured. However, you can always get a second opinion if you are not satisfied with your doctor's diagnosis. I hope this helps. @buttercup, do you mean the tonsils? You should tell your partner to go and see a doctor as soon as possible as this isn't normal and it could become infected if it continues. i have felt like i have something stuck in the back of my throat. i am constantly swallowing to 'release' this blockage but it still remains. there is no obvious sign of anything visible in there and some times it seems like a rancid liquid is been secreted which tastes horrible. this has happened a few times now. the 'blockage' has been there for about two weeks now more prominently however longer but not as irritating. when i lay down it feels like i have something stuck between my larynx and the back of my mouth. i try to 'massage' this are to relieve it but it does not work. please could you help. nothing i have read seems to describe my symptoms.